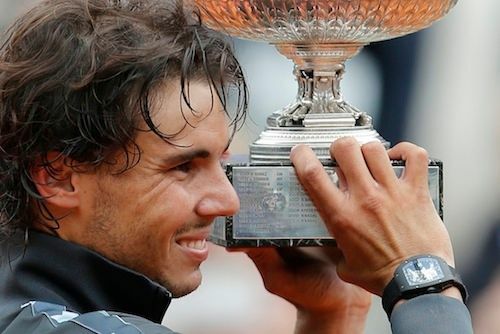 Rafael Nadal, who won Roland Garros for the 7th time last Monday, reported his Richard Mille RM027 Tourbillon stolen from his hotel in Paris. This $374.000 USD tourbillon time piece was lend to him by sponsor Richard Mille. Unfortunately for Rafael Nadal (and Richard Mille), it wasn’t the first time that he lost one of his precious RM pieces. It happed before in 2010 with his $500K USD Richard Mille. French news paper ‘Le Parisien’ reported that the police traced the swiping card from hotel room and ended up arresting a bar tender from the hotel. The bar tender confessed the theft and led the police to the watch on Tuesday night. The bar tender hid the watch near a Metro rail track where the police found it and returned it safely to Rafael Nadal.